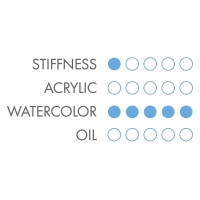 Neptune is Princeton's thirstiest brush ever, delivering oceans of color to the sheet. 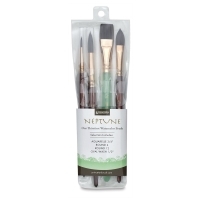 Featuring the latest synthetic fiber technology, the Neptune's multiple-diameter filaments are configured to replicate the smooth feel of natural Squirrel, with enhanced snap and resilient strength. Experts in natural hair have been incredulous that the Neptune brush fibers are actually synthetic. 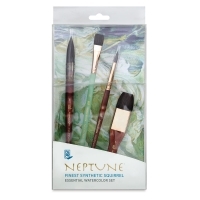 Neptune Synthetic Squirrel Brushes, Box Set of 4 — This set includes one each of Aquarelle 1/2", Quill 6, Round 8, and Mottler 1", all with short handles. 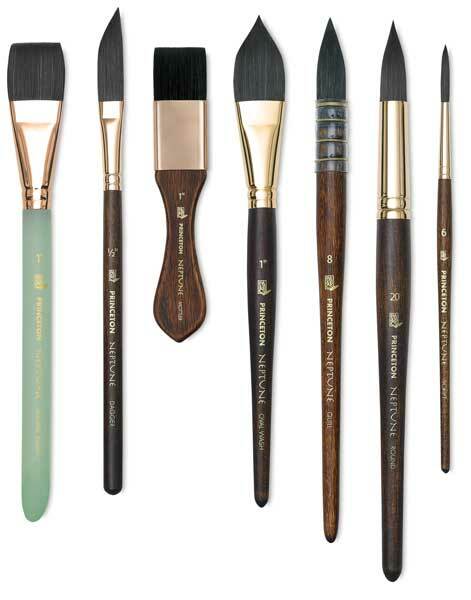 Princeton’s thirstiest watercolor brush, Neptune brushes hold as much water as natural squirrel, yet are more durable and more affordable. 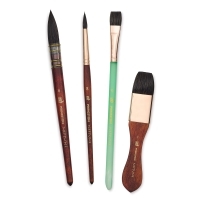 Neptune Synthetic Squirrel Brushes, Set of 4 — This set includes one each of Aquarelle 3/4", Round 4, Round 12, and Oval Wash 1/2", all with short handles. 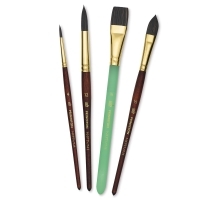 Princeton’s thirstiest watercolor brush, Neptune brushes hold as much water as natural squirrel, yet are more durable and more affordable.